Must Sees in Canada – We all know that Canada is a land filled with polite and friendly people. As a traveler, we are aware that it’s the people that make our traveling worthwhile and memorable. But if you think this 9.3 million plus kilometer land is all about maples and politeness then think again. They are blessed with magnificent landscape, alluring bodies of water, and exciting activities. They have most of the terrain you can think of from glaciers to beaches, from rainforest to rocky mountains. A country deserved by seasoned travelers. If you find yourself overwhelmed by the vastness of must-sees in Canada then let me help you out. I’ll discuss four of my hand-picked destination in the beautiful Great White North. Around 50km or a 45-minute drive from the great city of Toronto, Lake Simcoe is a place to be when you think about water-related activities. Known for its beautiful shores, clear water, and abundant fish, this lake needs to be on your must-see and visit list. The lake covers about 52km of shoreline, perfect for swimming, boat riding, watersports, and fishing. It is the perfect spot for anglers, from Canada even in the United States, due to its close proximity to nearby main cities and richness in variety of fish. Only a handful of lakes in Canada have the same amount of abundance of fish species so remember to bring your trusty fishing gear if you want to encounter some trout, whitefish, smallmouth and largemouth bass, bowfin, northern pike and many more. If you think experiencing a winter wonderland is all about visiting malls with white winter decorations or visiting a skating ring in downtown, then you need to know about Banff. Banff National Park is the oldest national park in Canada, located in the province of Alberta. It offers the most surreal winter wonderland experience anyone can wish for. Its known for its icy landscape, breathtaking lakes, picturesque pine forest. This national park has the best of the best the winter season can provide. You can chill in the backcountry lodges and indulge yourself with some magnificent snowy mountain views or experience adrenaline in the chilling weather by playing activities such as hockey, skiing, ice skating or even dogsledding. Remember to book your accommodation early because this park is considered one of the most visited national parks in North America with around three million visitors every year. 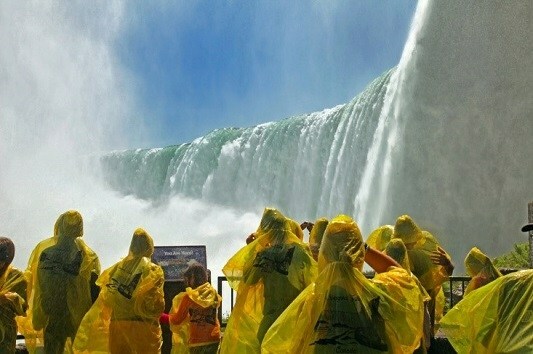 It should be no surprise that the Niagara Falls fall into this list. With its majestic height, powerful might and beautifully epic plunge, failing to miss this spot is like failing to see Canada at all. Niagara Falls is actually composed of three falls and divides the border between Canada and USA. One of the falls and its biggest and most renowned is called Horseshoes Falls, also known as Canadian falls. Majority of this fall is located in the Canadian border. Seeing, living and breathing from a distance to appreciate this God-given nature may be enough but you can actually explore it a little bit more intimately by hopping in on a boat tour that will take you underneath its plunging waters. In addition to that thrilling experience, there are many nearby child-friendly activities around and some impressive light show at night. You will probably be tired by the time you are done with Lake Simcoe, Banff and Niagara Falls. Now it’s time for you to chill, relax and get your piece of mind. Thankfully, there is a place in Canada called the Garden City, the city of Victoria in Vancouver Island. Around 76 miles in the southwest of the bustling city of Vancouver, Victoria and Vancouver island is a getaway from all the noise, hustle and stress of modern life. Going to the island leaves you with a number of good options, you can take a 4-hour trip by car or bus and ferry; or a 35-minute flight. This place is filled with colonial architecture, glorious heritage buildings, mesmerizing gardens, and scenic harbor. The streets in this city are teeming with street vendors, cafes, and restaurants. Perfect for a relaxing but interesting walk. The best way to get around and do sightseeing on the island is by bicycle. The city of Victoria prides itself with plenty of cycle routes that any city in the country. Canada is a charming country no matter the season. They have great population diversity, friendly and warm people, amazing nature and exhilarating outdoor activities. A true haven for seasoned travelers.